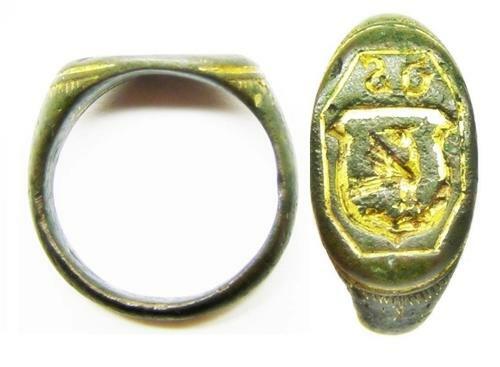 This is a wonderful Renaissance period signet ring, dating to the 16th - early 17th century. The bezel is cut with a pseudo armorial depicting a phoenix, above the owner's initials. The shoulders simply decorated with a sunburst. This ring would have been worn by a merchant, used to seal and authenticate transactions or letters. Originally the ring would have been fully mercurial gold gilded, though over the centuries this has mostly worn but is retained in the recesses. It is a handsome signet ring, an ideal piece to be worn and used again today! DATE: c. 1550 - 1620 A.D.
PROVENANCE: Ex. private collection, London. Originally found in Ferrara, Italy.